At the Green California Summit & Expo this week, I saw a strange sight: a group of greentech manufacturers hanging out in the halls, griping about environmental regulations. Their point? That a surfeit of command-and-control measures makes compliance such a lengthy and costly process that it’s hard to bring innovations to market. That’s a nice self-defeating outcome! I was thinking of lighting, but it could be anything. Letters a-e represent technologies with different properties. The red area is banned as too toxic. The blue area is banned as too inefficient. That leaves only technology a. Maybe that’s OK, but what if a is made in Cuba, or emits harmful radiation, or doesn’t work in cold weather? That’s how regulations get really complicated and laden with exceptions. 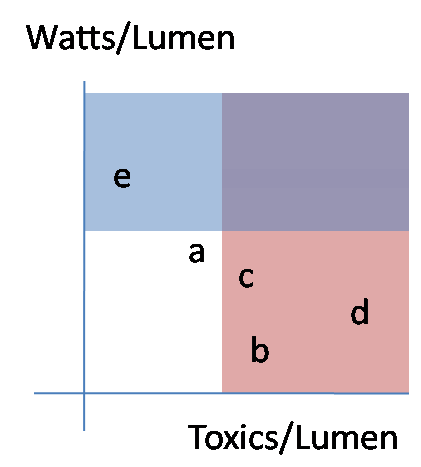 Also, if we revise our understanding of toxics, how should we update this to reflect the tradeoffs between toxics in the bulb and toxics from power generation, or using less toxic material per bulb vs. using fewer bulbs? 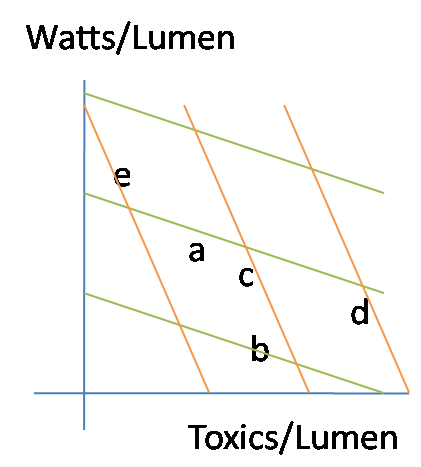 Notice that the only feasible option here – a – is not even on the efficient frontier; a mix of e and b could provide the same light with slightly less power and toxics. Proliferation of standards creates a situation with high compliance costs, both for manufacturers and the bureaucracy that has to administer them. That discourages small startups, leaving the market for large firms, which in turn creates the temptation for the incumbents to influence the regulations in self-serving ways. There are also big coverage issues: standards have to be defined clearly, which usually means that there are fringe applications that escape regulation. Refrigerators get covered by Energy Star, but undercounter icemakers and other cold energy hogs don’t. Even when the standards work, lack of a price signal means that some of their gains get eaten up by rebound effects. When technology moves on, today’s seemingly sensible standard becomes part of tomorrow’s “dumb laws” chain email. The solution is obviously not total laissez faire; then the environmental goals just don’t get met. There probably are some things that are most efficient to ban outright (but not the bulb), but for most things it would be better to impose upstream prices on the problems – mercury, bisphenol A, carbon, or whatever – and let the market sort it out. Then providers can make tradeoffs the way they usually do – which package of options makes the cheapest product? -without a bunch of compliance risk involved in bringing their product to market. The green and orange lines represent isocost curves for two different sets of energy and toxic prices. If the unit prices of a-e were otherwise the same, you’d choose b with the green pricing scheme (cheap toxics, expensive energy) and e in the opposite circumstance (orange). If some of the technologies are uniquely valuable in some situations, pricing also permits that tradeoff – perhaps c is not especially efficient or clean, but has important medical applications. With a system driven by prices and values, we could have very simple conversations about adaptive environmental control. Are NOx levels acceptable? If not, raise the price of emitting NOx until it is. End of discussion. Fed green buildings guru Kevin Kampschroer gave an interesting talk on the GSA’s greening efforts. He expressed hope that we could move from LEED (checklists) to LEEP (performance-based ratings). I heard from a lighting manufacturer that the cost of making a CFL is under a buck, but running a recycling program (for mercury recapture) costs $1.50/bulb. There must be a lot of markup in the distribution channels to get them up to retail prices.